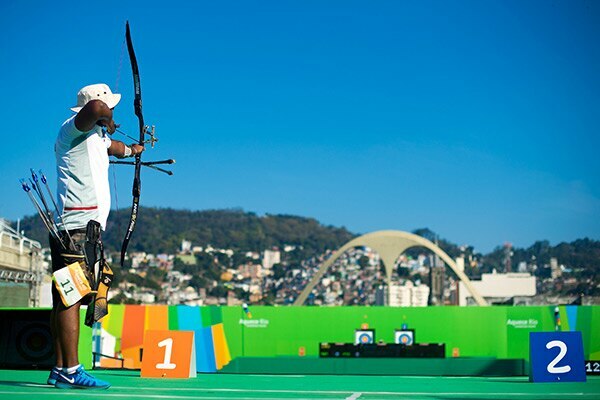 On 15-22 September, Rio de Janeiro’s Sambodromo played host to the Aquece Rio International Archery Challenge. The official archery test event for Rio 2016 saw 125 athletes from 27 countries competing at the iconic venue, which is best known as the hub for Rio’s world famous annual carnival, and the atmosphere was suitably festive. Choi Misun and Kim Woojin from traditional archery heavyweights the Republic of Korea, each produced phenomenal performances to win gold in the women’s and men’s individual events respectively. Women’s recurve winner Choi put an incredible 15 of her last 21 arrows of the competition into the 10-ring as she overshadowed two of her more feted Korean team-mates, Ki Bo Bae and Kang Chae Young. Reigning world champion Kim conjured a similarly impressive display in the men’s gold medal match, with 11 of his 15 arrows scoring the maximum, enabling him to edge the Netherlands’ Sjef van den Berg into second place. Another Korean archer, Ku Bonchan, completed the men’s recurve podium as he beat India’s Jayanta Talukdar to the bronze medal. The South Koreans also won gold in the men’s and women’s team competitions to complete a clean sweep of the titles at the test event. “From the views of the city and its lively atmosphere, and the Sambodromo itself, to the famous statue Christ the Redeemer visible in the background, there’s no mistaking where we are and what we’re here for,” added Dielen.